Hi! Has anybody found an effective fungicide to control Ganoderma disease in oil palm plantation, either in Malaysia or Indonesia? We are using Sinergizer (Booster) to strengthen Oil Palm Tree resilience against decease. We are not using a fungicide to cure the decease. Strengthen Oil Palm Tree means sufficient Nutrition for the Tree. Call me if need help. The Ganoderma Basal Stem Rot (BSR) disease is caused by bracket fungus Ganoderma. It is lethal and incurable for more than 50 years now. During replanting, if the old oil palm trunks are left to rot on the ground, various fruiting bodies of Ganoderma may be produced and thrive. 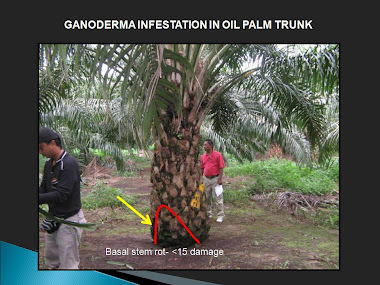 Ganoderma Basal Stem Rot (BSR) is fast becoming a major threat to oil palm cultivation and palm oil production countries. It has also been reported that the disease is present in more than 53% of the oil palm plantations in Peninsular Malaysia. Without treatment, more than 80% of the affected plants may die by the time they reach less than halfway through their lifespan. The losses can amount to a reduction of 25% to 45% yield in fresh fruit bunches. 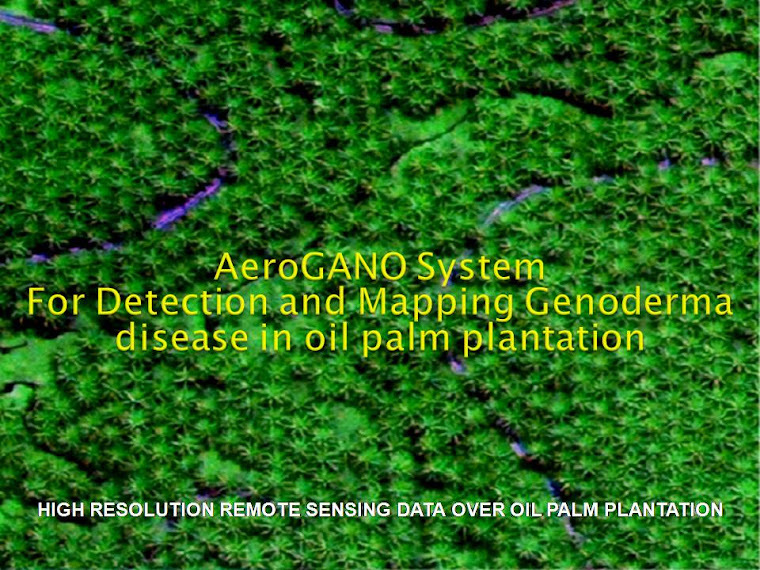 Hyperspectral remote sensing data used in the Ganoderma mapping is quite a new technology. It is also known as imaging spectroscopy. It is being used by scientists to the detection and identification of minerals, terrestial vegetation, and man-made materials and backgrounds. Hyperspectral remote sensing combines imaging and spectroscopy in a single system which often includes large data sets and require new processing methods. Hyperspectral data sets are generally composed of about 100 to 200 spectral bands of relatively narrow bandwidths (5-10 nm), whereas, multispectral data sets are usually composed of about 5 to 10 bands of relatively large bandwidths (70-400 nm). White rot fungi such as Ganoderma, are extraordinary organisms capable exclusively of degrading lignin to carbon dioxide and water: celluloses are then available as nutrients for the fungus. It is necessary to consider this mode of attack as a white rot involving lignin biodegradation, for integrated control. The white rot perception opens up new fields such as (a) especially breeding/selecting for resistant cultivars of OP with high lignin content, (b) ensuring that the conditions for lignin decomposition are reduced, and (c) simply sealing damaged OP specifically to stop decay. It is likely that spread is by spores rather than roots. The knowledge gained can be employed in the rapid degradation of OP waste on the plantation floor by inoculating suitable fungi, and/or treating the waste more appropriately (e.g. chipping and spreading over the floor rather than windrowing). 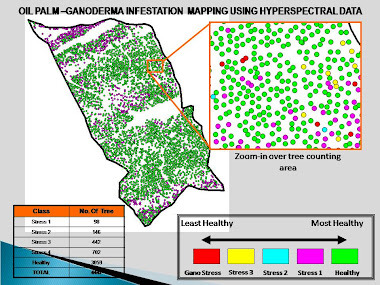 Figure 1 shows the result of image processing of hyperspectral remote sensing data for ganoderma detection and mapping. 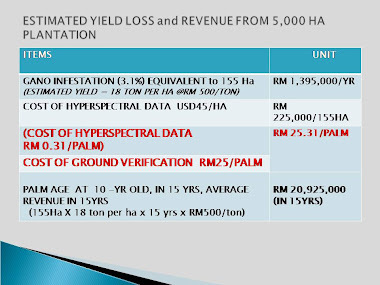 The block of 40 hectare of oil palm plantation has been analyzed based on spectral reflectance analysis and correlation analysis of hyperspectral data. It show that the plantation has five levels of crop healthiness: most healthy, first level of stress, second level of stress, third level of stress, and fourth level of stress (due to ganoderma). The fourth level of stress was analyzed by using tomography detector Figure 2. Ninety eight (98) of 4447 palms were infested by ganoderma disease. Malaysian Palm Oil Board has made a study to control ganoderma disease in oil palm plantation. 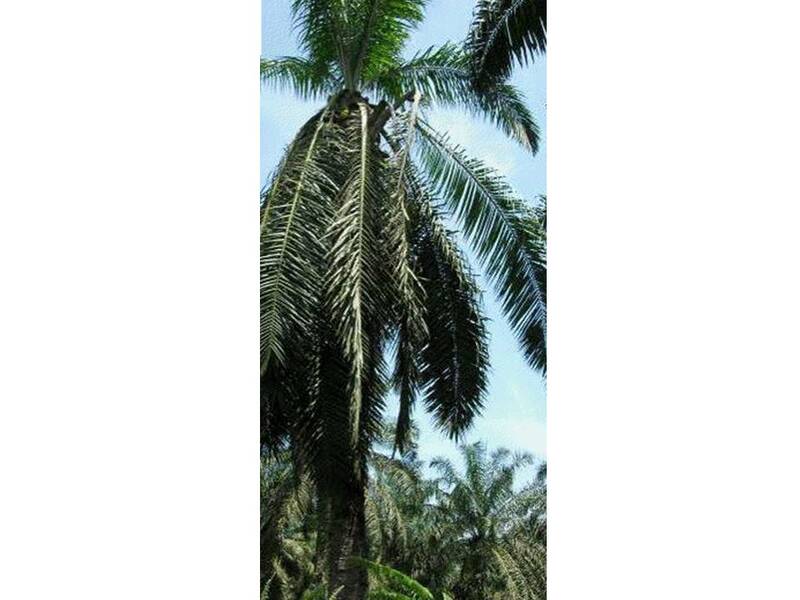 The study was carried out by injecting fungicide into the oil palm trunk. A pressure pump was used. The apparatus consists of injector, hose, stop cork, connector, pressure pump engine and chemical tank. The treatment was done by drilling a hole into the trunk. A stainless steel injector (size 50 cm length and 1.2 cm diameter) was inserted into the drilled hole, and the supply high pressure hose was connected by the injector to the stop cork and the chemical tank. Studies have demonstrated that the application of fungicides with PIA appeared to limit the spread of Ganoderma infection within the infected standing palms. 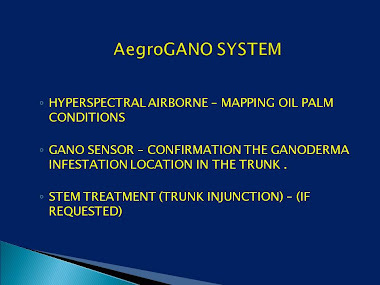 With development of this apparatus, control through the use of fungicides should not be limited to treating oil palms with confirmed cases of Ganoderma only but also to neighbouring oil palms which are in potential danger or might have already been infected at sub-clinical level. 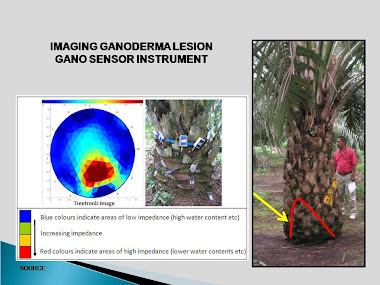 The use of fungicides to treat young oil palms not showing obvious signs of infection but in an area with serious history of Ganoderma also needs to be evaluated as a preventive measure. contact: laili200@yahoo.com. Simple theme. Powered by Blogger.